Before the book was released, critics joked that an alternate title for the novel could have been Mugglemarch, pointing to it's similarities to George Eliot's Middlemarch, a book I've read twice and respect greatly. 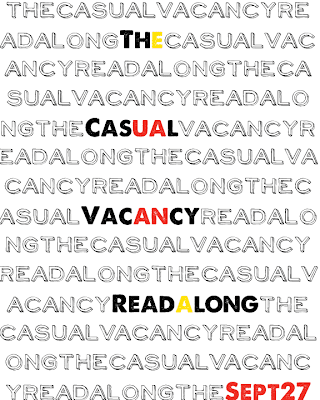 The main similarity I noted between The Casual Vacancy and Eliot's classic is that both revolve around a plethora of characters who are all interconnected in a web of dishonesty. That, and both novels lean towards the depressing side of human nature. But that's human nature; it's irrational, selfish, and ignorant. Rowling's novel explores this less than glamorous side of human nature, exposing its weaknesses through a number of imperfect characters. He never seemed to grasp the immense mutability of human nature, nor to appreciate that behind every nondescript face lay a wild and unique hinterland like his own. The last thing I want to do is compare The Casual Vacancy to Harry Potter but what I will say is that if anything, Harry Potter proved that not only does Rowling have an incredible imagination, but she's got a gift for conveying her richly imagined worlds through her writing. In my opinion, there was nothing very imaginative about this novel. Of the ideas she presented, there was nothing new in the way she brought them forth. I did not feel challenged while reading her book (if you don't count my difficulty to finish it) and it all felt a bit mundane. What I will say is Rowling proved she can write adult fiction and she can write it well - her prose is crafted beautifully and her characters are well developed. I'm just hoping that her next novel is more absorbing and a little less trite. Read my initial thoughts on the novel here. I'd also like to thank Beth at Bookworm Meets Bookworm once more for co-hosting the read-along and for designing the lovely button you see above. I agree with everything you've mentioned. I didn't think the novel was incredibly creative in terms of storyline. It seemed like something that had been done in so many novels before with far more pages. Her strength lies in building a setting and the characters that inhabit it, but doesn't necessarily make it terribly engaging. I felt I had to really push myself to read for most of the book. It wasn't until I was about 150 pages away from finishing that I finally got a groove and polished it off. I'm interested in seeing what she'll publish in years to come, but this wasn't the most exciting novel I've read in years. I've seen people remark that if it weren't for her name, the premise never would've hooked people, which is probably true. You managed to get it all out so eloquently-- a task I struggled with and clearly did not deliver on! It was fun to participate, regardless! You are definitely right that her strengths are in setting and characters. I was not disappointed in terms of either of those. 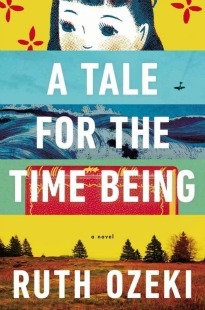 I was actually thinking this morning about whether or no I would have picked up this novel based on the premise alone without knowing who wrote it and I really don't think I would have. I really enjoyed your final post! You've got to give yourself more credit! I keep reading similar reviews of this book. I think I'm going to wait awhile before I read it. I can't help but have high expectations and maybe it I wait a bit. I think there's no way not to be disappointed after HP. It was a bit of a let down but like I said, I am glad I read it. It just should have been shorter... Looking forward to what you think when you do get around to it! Looking forward to trying this one myself. I'll look forward to your thoughts! I'm about 100 pgs. in so I just skimmed your review...Rowling's strength is definitely in character development and the descriptions that she creates. 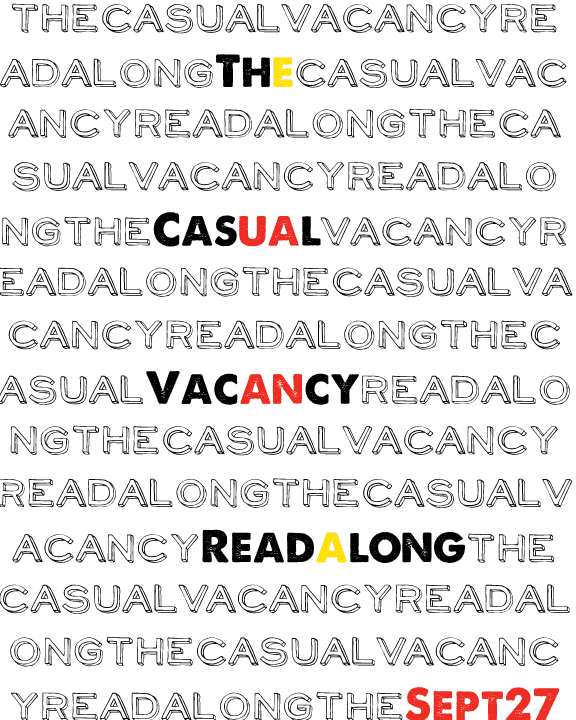 I definitely had a much more positive reaction to The Casual Vacancy, but I can completely understand why you felt so-so about it. I really loved the way JKR used mundane events and small-town politics to comment on larger worldviews. The ending didn't feel contrived to me (except maaaybe the various characters seeing and ignoring Robbie), but it did feel a bit rushed. Rayna, thanks for your thoughtful response. I'm off to look at that interview you linked - thank you for sharing! Like Rayna, I too had a much more positive experience with The Casual Vacancy. I thought the mundanity (is that a word? Spell check thinks no, but I am a-usin' it anyway) was compelling, not a detractor; the small-town details that Rowling has created are what made the story so intriguing to me. I think it is because I was reading them both at the same time, but I found it similar to Emma in that regard; the world of gossip and detail and everyday events ARE the events, in the end (though Rowling's end does go a bit outside the "everyday"). Thanks for hosting the readalong, and sorry you didn't love this one! I think that if I read it (I haven't felt any inclination to), I will hopefully go in with such low expectations that the book might actually surprise me. Although I gather that it's actually the fact that it's not so very original and surprising that makes this book a bit of a let down? Also, and I know that this is random - I apologize, you have the most stunningly beautiful banner! An interesting review, especially as Middlemarch is an all time favourite of mine.